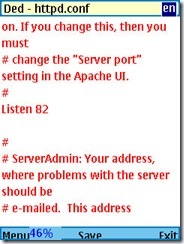 Mobile Web Server will turn your phone into a web server. You can even install PAMP (Personal Apache MySQL PHP) in it, but I didn’t try installing PAMP, because I haven’t seen the use of it yet (except for draining my battery faster). The basic web server can be accessed by the world, or you can just make it locally accessible. I have tried this software before, but at that time, I didn’t see any use of it, but now, things have changed, and I found several use of it. 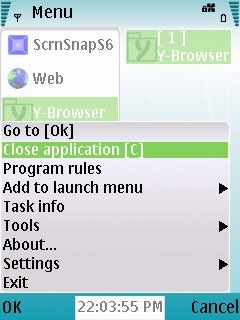 The mobile web server provides many applications (blog, calendar, etc), but I didn’t use most of the features. First use is to view some SMS with Thai text. My phone doesn’t have proper support for Thai language (it was bought in Indonesia), so all Thai characters appear as boxes. With JoikuSpot Light, I can see the text on my desktop browser, and I can even see the text on my iPod touch. This is very nice. The second use is to quickly get a picture from the phone to the desktop. Using Bluetooth from PC I can not preview to select which image to transfer, and browsing the images in the phone then sending it takes quite some time. This is also useful to transfer pictures from the phone to iPod touch, to be used in Facebook application (or any other applications). Here is a tip on how to make JoikuSpot Light edition works with mobile web server. If you connect via WIFI through JoikuSpot Light, you will be directed to a landing page (JoikuSpot page), and you can not access the web server (because it tries to use the same port). To make it accessible, just change the web server port. To edit the web server port, edit the file the file httpd.conf in \Data\Web server\conf. Find the line Listen 80 to Listen 82 (or some other port). 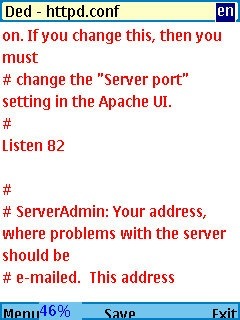 The comment lines above it says you must change the server port setting in the Apache UI (but I can not find the setting). Anyway, it works just by stopping the server, editing the file, and starting the server again. You can edit from desktop, or just use Dedit to edit directly from the phone. 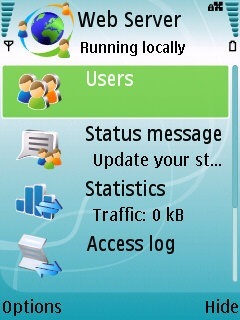 You can download mobile web server and register your site at http://mymobilesite.net/. I won’t bother sharing my site here, because most of the time my site will be offline. Btw, I think it will be much nicer if someone can change the current web applications to use the iPod touch user interface. JoikuSpot is a software to share your phone’s Internet connection via WIFI. It turns your S60 3rd edition device into a hotspot. 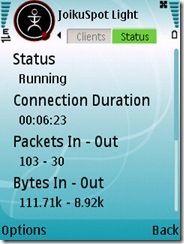 The premium version of the software allows you to use any connection, while the Light version only allows you to use web (HTTP) connection. This is not a new software, but I only start using it few days ago since I got my unlimited EDGE/GPRS connection. I have an iPod touch, and this software is a perfect companion for it, just like they said on their marketing page: Nokia s60 3rd edition phone + JoikuSpot + iPod touch = iPhone. I am still considering whether to buy the full version or not. Compared to data cable, sharing Internet connection using JoikuSpot is much nicer. Compared to bluetooth, I think JoikuSpot uses more battery power. Unless you want to share one phone connection to several devices/computers, I think Bluetooth is more than enough for Internet sharing for most people. 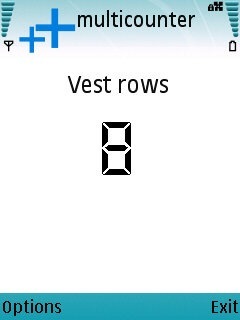 I haven’t done much Symbian programming in the past few months, and I haven’t got the time to improve the current freewares that I have (Log Export, MsgExport, and others). But today, I managed to write an application for my wife, a multi counter. My wife likes to knit and crochet, so actually she will use it as a stitch counter (row counter). This application was inspired by StitchMinder for iPhone. I try to make this application as simple as possible. Press right to increase the current counter, or left to decrease the counter. Press up or down to go to the previous or next counter. You can add a new counter, or delete, and rename existing counters. You can also diretly set the counter value. You can have unlimited counters with this application. 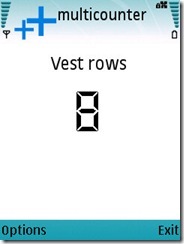 The data for the application are stored as text files in C:\data, which you can access using a file manager, or through the Desktop using Nokia PC Suite. Why do i put the data in a public directory? so you can import/backup your count to PC if you need it. The file count-data.txt contains the counter data (names of the counter and the count), the file count-names.txt contains only the names of the counter, and the file count-current.txt contains the current active counter. You can download multicounter.sisx from here. Update: Java/MIDP/J2ME version is also available. Two links are available: JAD file to install directly from your phone http://tinyhack.com/MultiCounter.jad, and JAR file to install from PC http://tinyhack.com/MultiCounter.jar. If you visit this page from your mobile phone, just click on the JAD link. Or if you want to install from your PC, just click on the JAR link. Note: for J2ME version, you can not access/backup the counter data. The J2ME version has been tested on Nokia E51, Nokia 7610, Sony Ericsson P990i, and Nokia 9300i. If you have S60 3rd edition, then native version is much better (faster startup and uses less memory). DEdit is an amazing text editor, it has so many features, and is very fast. It can handle large file. I tried opening 168 kb file (Alice In Wonderland form project Guttenberg), and it opens the file very quickly. I can search and replace text, create bookmark,even setting the look and feel of the program. 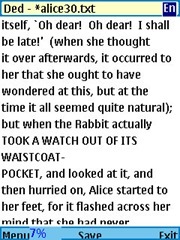 Some features still doesn’t work properly, such as the Template (which causes it to exit) and scroll by page (which misses a line or two, when this is fixed this can be a good ebook reader). All in all, this is a great program. If you need to read or create text files on the go, I suggest you try this program. JBak Taskman is also an auto start manager with more options compared to PowerBoot. Finally JBak Taskman also acts like AppQLaunch, you can press # to show the list of installed applications, and you can just type in the name to filter the list of applications. There are 57 Posts and 387 Comments so far. S603rd Edition Freeware © 2019 All Rights Reserved.